Alpinestars Haze Air Jacket. After an extensive usage of this jacket on our filming and our daily riding. It is safe to say that this jacket serves as a great introductory level of jacket to the Asean region due to it’s well known humidity and heat. The level of protection that the Haze Air jacket offers is pretty basic and might suited to the level of crash at a sub 100km/h speed. But we haven’t really faced to circumstances that can really challenge it’s breaking point on impact or scrapes. Therefore, we are assuming that it can help reduce the damage to your body and skin at a sub 100km/h crash. The jacket definitely stands out in white and black with red trims, the looks is clean and stylish enough to bring out the alpinestars pride out of the wearer. But, it can be a little bit difficult to maintain in terms of cleanliness. The white majority of the jacket definitely gets dirty easily and that will eventually gives a beat up look to the jacket. The Haze Air was certainly made with riders from Asean region in mind, the comfortability of the jacket is superb. The jacket as what we call here “a mesh jacket” serves as a much comfier option to the rather heavy and uncomfortable leather jacket. The “Air” in the jacket’s name suggest that it is a cooling jacket to be worn during your ride on a sunny day and that was proven to be true when our test riders uses it during their filming. The lightweight jacket helps the rider to move with hassle on the bike and this help reduces fatigue to the rider. With less fatigue, rider may be able to focus more on the riding hence making the activity much more joyful and safer. Safety is not the best feature on this particular jacket as it serves for an introductory level of riding and that means a lower speed riding. As usual, it is highly unlikely for riders to be riding slowly all the time; therefore it is not ideal to use the jacket for your weekend riding with your high intensity buddies. It will suit you better if it is to be used for commuting to work and your home or going to a quick get up with your riding buddies. The stitching on the jacket was done properly but the materials may not withstand a prolonged scrapes in the case of a lowside crash. Therefore, it might break and be unusable after 1 crash. With the move by alpinestars to manufacture their products in Vietnam, the quality may be in question by most consumers out there. But after nearly 2 years of usage and tested in almost all condition available in Malaysia, it successfully withstands the durability test and certainly have the quality that we’re expecting from Alpinestars. The jacket structure is simple, therefore it doesn’t seems to require a high level of built to it. Once again, the stitching seems solid and the finishing on the jacket looks good even after a heavy usage of it. 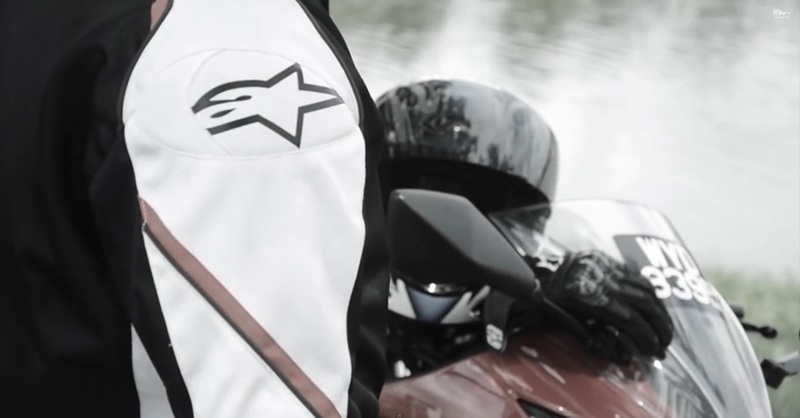 Alpinestars Haze Air Jacket might not be available in the market anymore since it was made under 2013 catalog.